Ahh brunch. That amazing, leisurely meal where you get the best of both the breakfast and lunch worlds and it’s totally acceptable to pair your meal with a bloody Mary and call it a healthy start to the day. We all brunch like crazy when we go on holidays, but us Perthlings are often more likely to organise a catch up over breakfast or lunch on an average weekend. But with so many delish brunch options out there (and the fact that erryone loves a good sleep-in!) we reckon it’d be rude not to start brunching at least once a week for the foreseeable future. 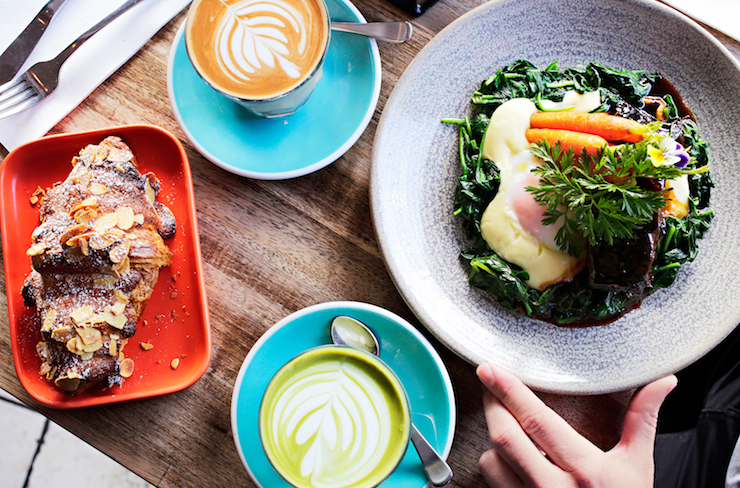 To get you started, here is where to find Perth's best brunch spots. Bread In Common ticks all of the boxes. Perfect Freo location, laid-back atmosphere, awesome exposed brick building and long share tables, duck fat potatoes that will rock your world and the best bread in Freo. Another all time fave, West End Deli allows us to brunch like a boss every day of the week. The bircher is amazing, but it’s hard to go past the buttery mushroom terrine…and the avocado with peas and mint…and the corn and cheese croquettes. You know what, just get yourself one of everything. In the space that is Don Tapa by night, The Mantle Harvester dishes out brunch on Saturdays and Sundays and it's out of this world! They team up with the guys at The Brewhouse to make amazing kombucha cocktails like the Hooch & Booch—Kommunity Brew’s wild jasmine kombucha with gin, or you can craft beer and local wines if you're into that. Harvest are dishing up some of the most insta-worthy brunches in Perth and luckily they taste as good as they look. The menu changes on the regs, but right now, the tender beef short ribs with a slow cooked egg are the must try dish! Is there anything Mary Street Bakery can’t do perfectly?! We’d say no. They're famous for their fried chicken buttermilk pancakes, so you need to try those. And don’t forget to have a Bloody Mary while you’re there. One of the best croquet monsieurs in Perth, Mrs S also does a killer manwich and some delish salads. Save room for cake, you won’t regret it. Two words. Dukkah. Eggs. These are out of control. The bagels are also amazing and they do a brunch dog (#hangoverheaven). The smashed avo is killer on its own but why not treat yo’self and add halloumi. La Veen has an all-day kitchen menu which includes breakfast goodies, burgers and sweets. The coffee is outstanding and the food is delish. Potato rosti anyone? If you’re a fancy breakfast boozer then only the most stylish destination will do for your Absolutely-Fabulous-style start to the day. Enter Shadow Wine Bar, some crumpets and mascarpone, salmon and soft boiled eggs and grapefruit mimosas. You’ll need to nap immediately after. 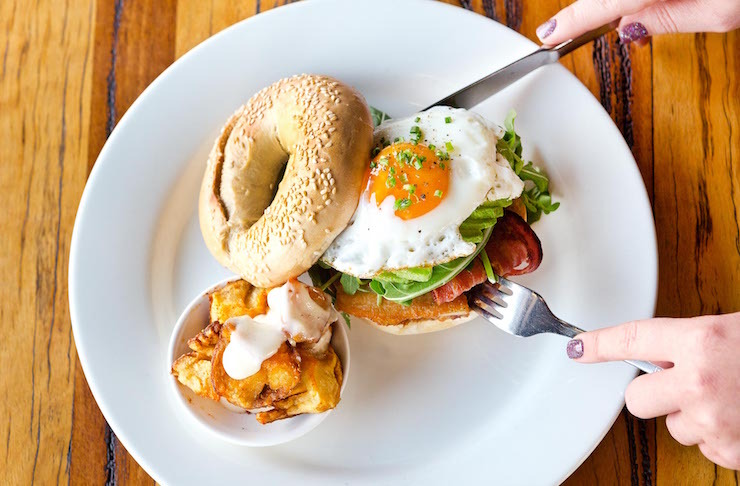 Tucked away in North Perth, Hobart Deli has been dishing up some of the best brunch eats to the North Perth locals for years. The rye bagel with avo and feta mash is the bomb and the zucchini and halloumi patties will rock your world. Layup is a solid favourite of ours when it comes to brunch in Perth. They do an epic huevos rancheros, delish buttermilk hotcakes and a lemongrass and coconut poached salmon dish that’ll blow your mind. 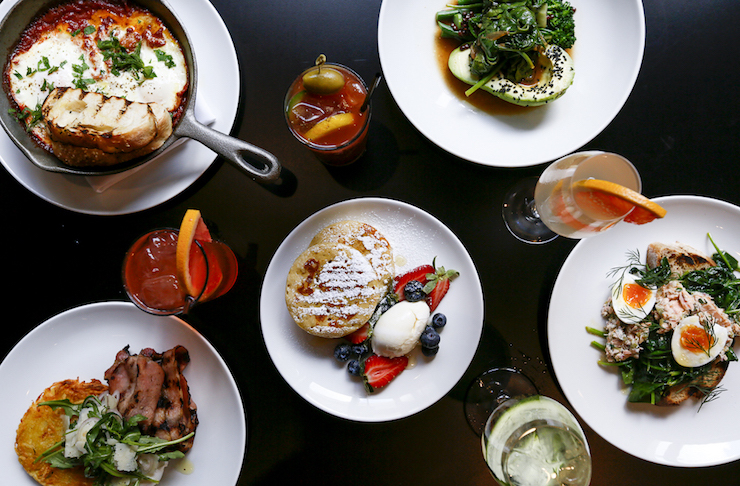 We all know New York is the brunch capital of the world and Hylin vibes New York in a big way. So it's no surprise they are whipping up one of our fave brunch menus. You can opt for a more traditional brekky, but it's hard to pass up that brie and brisket burger. The bagels are also amazing with a capital A. Have a little coffee tasting session then sit back and relax with a cup of joe and a traditional Singaporean brekky. The banana bread here is also a winning order if you’ve got a hankering for something a little sweeter. The dang dang beef—slow cooked lemongrass and coconut Angus beef shin with a crispy shredded potato croquette, fried egg and bok choy—will cause food related dreams for at least a month after you eat it. The bircher at Typika is also impressive, or if you want something really hearty get yourself some caramelised beef ribs. The best scrambled eggs in Perth, gnocchi to rival your best friends Nonna’s (don’t tell them that though) and espresso martinis that provide the perfect brunch buzz. Cantina is definitely one Perth's best brunch spots. With one of the best smashed avo dishes going around and some epic pancakes, this suburban cafe is dishing up some seriously beautiful brunches. Open for brunch all day on the weekends, as well as breakfast, brunch and lunch during the week, you’ll want to nab one of the big tables out the back and soak up the sunshine in the garden. Super cool Freo cafe Ootong & Lincoln oozes laid-back, retro vibes. The two enormous rainbow zebras painted on the wall outside are just the beginning here. The massive space and relaxed atmosphere make this the perfect place for a big brunch with the fam. The menu boasts some of Perth's best brunch fare—all made on site and all using locally sourced ingredients. I don’t line up for everyone, but when I do—it’s for brunch at Sayers Sister. And for those little muffins they give you while you are waiting in line (well played). There’s just too much to choose from on this top-notch menu—white sangria and leek croquettes or waffles with a Pimms and lemonade? At The Tribute in Shelley, the smashed avo is taken to new levels with dukkah crusted feta and beetroot puree, but it’s the pancakes that get us really excited. Loaded with cardamom infused apples (there’s even apple in between the two layers of pancakes—best surprise ever! ), sweet dukkah, vanilla spiced mascarpone and finished with pomegranate molasses, these are the actual best! And if you're being healthy, the nourish bowl will knock your socks off. Want more? Check out these 50 Perth Cafes You Should Have Had Breakfast At.